Eleanor Oliphant Is Completely Fine | This book gave me so many feels. Eleanor has developed a routine to simply survive every day life. No one has ever told her that life could be anything other than just fine. She has lived in and out of foster care and has never had nurturing relationships. As an adult she has little to no social skills. After a new co-worker befriends Eleanor, they have a chance encounter with a stranger and end up saving his life - creating a bond between the three of them. A bond that rescues themselves from the isolation they have each been living. At times I could relate to their struggles and at times I felt immense love and empathy. My biggest takeaway from this book is that opening up your mind and heart to others can change you for the better. 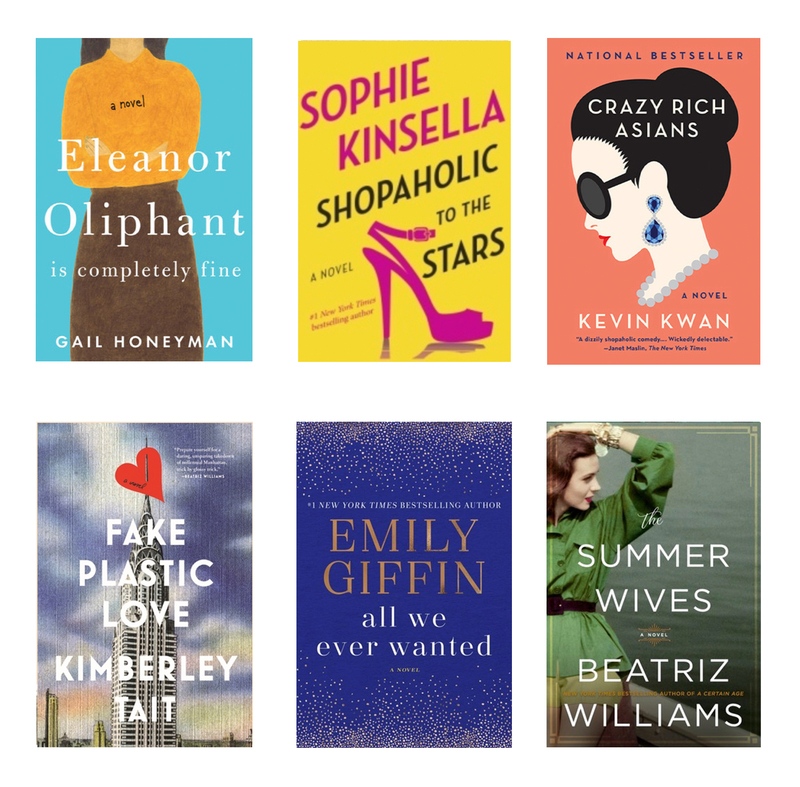 Shopaholic To The Stars | I've mentioned before that I love Sophie Kinsella and have been reading her books since I was in college. It was fun to dive back into Becky's crazy world and revisit some of my favorite characters. This book is similar to the others in the series. Crazy Rich Asians | I wanted to read this one before I saw the movie. Despite the book containing over 500 pages, it was a fairly quick read. Most of the characters in the book lead extravagant lives and it was a fun escape to have a peek into their world. The book was very entertaining and I was very excited to see how it came to life in the movie. Unfortunately there are very few similarities between the two and the movie's plot is actually drastically different from the book. I'll take the book over the movie any day! Fake Plastic Love | This was a fun read. It's interesting to read about how social media and technology affect our everyday lives as it's a relatively new phenomenon, even if this book was faction. Fake Plastic Love explores the dangers that take place when the life you live online doesn't match the life that you live. How does that affect your relationships and when does the line blur between real and fake. It was an interesting and fun read. All We Ever Wanted | I got through this book in a few short days. I just love Emily Giffin as an author. All We Ever Wanted explores the dangers of social media and how one small mistake could have life-long effects. It was interesting to get a perspective of the main storyline from all different characters in the book. I felt it added a more comprehensive dimension to the story. Overall it was a good and easy read with a few life lessons thrown in. The Summer Wives | I borrowed this book from the library at the end of the summer and only got about halfway through before I had to return it. I got back on the wait list and finally got my second chance to finish it! I've said before how I love Beatriz William's ability to weave through time and this book was no different. This story explores a few families on the east coast and the complicated dynamics to the lives they live and the secrets they keep when they visit their summer houses.